The area known as Poblet was once a neighbourhood of fields and low-rise houses. During the 19th century, factories were set up here, fostering the growth of the area. It was here, in 1881, that building work commenced on the church of atonement for the citizens of this expanding city. In 1882, the original Sagrada Família Gothic church project, designed by Francesc de Paula Villar, was taken over by the young Antoni Gaudí, who transformed it into the most fascinating church of all time. An architectural bible called the Sagrada Famíliawhich has become a Barcelona icon. The building, which is still under construction, has lent its name to the area and made it world famous. After all, the Sagrada Família is a vibrant neighbourhood with its own unique personality. The Avinguda Gaudí, a delightful pedestrianised boulevard, links the basilica with the Sant Pau Recinte Modernista, the most representative civil building from the modernista period, designed by Lluís Domènech i Montaner. Both these outstanding modernista landmarks have been declared UNESCO World Heritage Sites. The Avinguda de Roma links two sections of the left side of Barcelona's Eixample. To the south, we find the oldest part of the district, built at the end of the 19th century at the same time as the neo-Romanesque Barcelona University building, in the Plaça de la Universitat. Nearby, is the section known as the Ninot, which takes its name from an old inn which had a carving of a small child (the ninot) outside. The carving now stands above the market entrance. As you walk through the neighbourhood, you'll be surprised by the bustle and activity of the shopping streets, and the ones around the busy Mercat de Sant Antoni. The area between the Ronda Sant Antoni and the Ronda Universitat is known as the "Gaixample", where Barcelona's gay community have opened bars and restaurants. Further west, the most modern part of the left side of the Eixample consists of buildings in different architectural styles built from the 1930s onwards. However, the landmarks are two older buildings: the old Batlló factory, now the home of the technical college, the Escola Industrial, and the former municipal slaughterhouse, now the site of the modernista style Parc de Joan Miró, with the artist's monumental sculpture Dona i Ocell (Women and Bird) rising up in the centre. Barcelona, the capital of Catalonia, is the second largest city and metropolitan area in Spain and sixth-most populous urban area in the European Union. It has hosted many major international tournaments and has professional teams in different sports. The 1992 Summer Olympic Games (Spanish: Juegos Olímpicos de Verano de 1992; Catalan: Jocs Olímpics d'estiu de 1992), officially known as the Games of the XXV Olympiad, was an international multi-sport event played in Barcelona, Spain in 1992. Beginning in 1994, the International Olympic Committee decided to hold the games in alternating even-numbered years; as a result, the 1992 Summer Olympics were the last competition to be staged in the same year as the Winter Olympics. The games were the first to be unaffected by boycotts since 1972. FC Barcelona is one of the most widely supported teams in the world, and the club has one of the largest social media following in the world among sports teams.Barcelona players have won a record number of Ballon d'Or awards (11), with recipients including Johan Cruyff, as well as a record number of FIFA World Player of the Year awards (7), with winners including Ronaldo, Romário and Ronaldinho. In 2010, three players who came through the club's youth academy (Lionel Messi, Andrés Iniesta and Xavi) were chosen as the three best players in the world in the FIFA Ballon d'Or awards, an unprecedented feat for players from the same football school. Barcelona is one of three founding members of the Primera División that have never been relegated from the top division, along with Athletic Bilbao and Real Madrid. In 2009, Barcelona became the first Spanish club to win the continental treble consisting of La Liga, Copa del Rey, and the UEFA Champions League, and also became the first Spanish football club to win six out of six competitions in a single year, by also winning the Spanish Super Cup, UEFA Super Cup and FIFA Club World Cup. In 2011, the club became European champions again and won five trophies. This Barcelona team, which won 14 trophies in just 4 years under Pep Guardiola, is considered by some in the sport to be the greatest team of all time. By winning their fifth Champions League trophy on 6 June 2015, Barcelona became the first European club in history to achieve the continental treble twice. Barcelona's culture stems from the city's 2000 years of history and it is a bilingual city: Catalan and Spanish are both official languages and widely spoken. Barcelona houses a great number of museums, which cover different areas and eras. The Barri Gòtic ("Gothic Quarter" in Catalan) is the centre of the old city of Barcelona. Many of the buildings date from medieval times, some from as far back as the Roman settlement of Barcelona. Other historical areas include El Raval and El Born. Catalan modernisme architecture (often known as Art Nouveau in the rest of Europe), developed between 1885 and 1950 and left an important legacy in Barcelona. A great number of these buildings are World Heritage Sites. Especially remarkable is the work of architect Antoni Gaudí, which can be seen throughout the city. His best known work is the immense but still unfinished church of the Sagrada Família. At least two founding myths have been proposed for Barcelona by romantic historians since the 15th century. One credits the Carthaginian general Hamilcar Barca, father of Hannibal, with the foundation of the city around 230 BC, giving it the name Barkenon. Despite the similarities between the name of this Carthaginian family and that of the modern city, it is usually accepted that the origin of the name "Barcelona" is the Iberian word Barkeno. The second myth attributes the foundation of the city to Hercules before the foundation of Rome. During the fourth of his Labours, Hercules joins Jason and the Argonauts in search of the Golden Fleece, travelling across the Mediterranean in nine ships. One of the ships is lost in a storm off the Catalan coast, and Hercules sets out to locate it. He finds it wrecked by a small hill, but with the crew saved. The crew are so taken by the beauty of the location that they found a city with the name Barca Nona ("Ninth Ship"). One of the most fascinating things about Barcelona is it’s natural setting: in between the mountain and the sea. The northern border of the city is the Colserrolla mountain with it’s charming hiking trails and magnificent views of the city and the sea from up above. To the South, the city is bathed by the Mediterranean waters. Most residents are really conscious of this physical situation and when asked for directions, we often respond, towards the mountain or towards the sea to offer guidance. Barcelona has set the gold standard for European nightlife, and offers everything from swinging jazz joints to salsa spots — but what has really made this city the stuff of late-night legend is its outrageous nightclub scene. Locals know that the secret to fully enjoying the club experience is a scheduled afternoon siesta, because clubs in Barcelona don’t really get going until 2 or 3 a.m. — and they don’t stop until sunrise. Whether you’re looking for a performance from a world class DJ, or a night spent getting sweaty dancing under the stars, Barcelona has a limitless number of options for you. 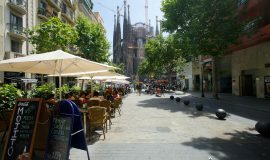 Perfectament situat al costat de la Sagrada Familia, en un carrer peatonal amb molts bars i restaurants. Es lloga per mesos, la estada mínima es de 32 nits.